This project was so easy, the kiddos helped me with the beginning phase. First I cleaned the window well, then taped off all the wooden areas. We used paper around the sides, taping it well to the edges. Next, I cleaned the window again, just to be sure. Then I took it outside (it was so pretty yesterday!) and used a can of chalkboard spray-paint. *TIP* -- once you have done two coats (letting the first coat completely dry first), hold it up to the sunlight so that you can see the areas that are not completely covered. I ended up using nearly the entire can -- four coats total. (There is just enough left to do a small picture frame -- yay!) You will paint straight onto the glass. If you lay the window flat, you will reduce the risk of runs, which is always my painting downfall. When it was dry, I brought it inside and pulled off all the tape, using tweezers to get into the nooks and corners. Now for the hard part -- you have to let it cure for 24 hours before using! OH--that part was not so fun! Make sure to use soft chalk, so you will not damage the paint. We have drawn on it all afternoon, and no scratches. Voila! A chalkboard from a free window. Total cost: $3.24 for paint, pennies for tape that was already in my decorating stuff. Don't forget! You, too, should join in on the fun next week for my first official Monday Funday! Just do something fun with your kiddos and share with everyone -- so we all get new ideas on projects or fun to share with our kiddos! Love it ~ what a great idea! If you have a spare minute (I know those don't really exsist) I'd love to have a chat with you about coupons. You seem to have a system that's working well for you. There are many sites out there but I'm not sure which ones really pay off. Our Commissary has begun accepting internet coupons so I'd like to take advantage of this option. You can contact me at JoLW35@yahoo.com Thank you in advance. Looking forward to the next fun project! Came back to say two things...is there a Monday Funday button? And that I forgot you live in Tennessee...have we discussed that before? And where in Tn. are you? I will post a Monday Funday button next week, I promise! That is great! I may have to try that sometime! What a perfect idea. I would have never guessed you could buy chalkboard spray paint. I've got to get some of that! I love that! That is so cool and I didn't know that you could buy chalkboard spray paint either. Can you use it on other surfaces? Can't wait to see what you're going to do with the rest of the windows! Awesome idea, Gina! And even better that you included your babies in the making of the project. I saw a pretty thing somewhere (Romantic Homes?) using old windows and mirror paint. Made a really nice background for other things like on a mantel or other place you want to have some cool vintage "layers". Thanks for stopping by my blog and letting me take a peak into your world! That's a great idea! I think it'd be great in my kitchen. Hello from a fellow SITSta! That is so lovely! I think I might try that project with my munchkins too. I love the spray paint chalkboard stuff! That is crazy good! Love it!!! What a fabulous idea!!! Gina, love, love, love how it turned out. What a great project to do with your kids! It turned out fantastic. Found your blog through my daughter Kate @the french nest. You are right...great minds DO think alike! I just saw a window frame at the thrift store....I am heading back to get it now! But before I go, thanks for stopping by my blog! I adore your blog. And am becoming a "follower". Thanks! Hope you will drop back my place again. I love friends...new and old. Great idea! I used mine for a message board with padding and shabby pink fabric. I sell them in my shop which you can see on an older blog post. Cindy -- What a fabulous idea! Hi, Gina, I'm so glad you are going to Blissdom too! It is gonna be so much fun to meet up with all of you. Let's definitely plan to meet in person. I'm rooming with Kimba & Jen at Balancing Beauty & Bedlam. I want one! That is beyond cute! oooh I love this chalkboard! You and Leigh have just convinced me that I need a chalk board. what a great idea! I love those old windows, so many possibilities! And what a treat to have a nice outside day for such a project-not many of those around here for a while! I love it and I have an old window in my garage! Thanks for sharing your ideas! omgosh! love, love, love this! wish i'd known this trick befor slapping chalkboard paint on my wall. 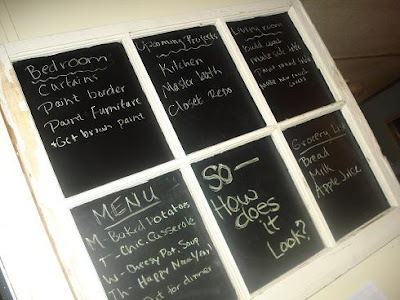 i now want it off...i didn't know you could chalkboard paint glass! i'm thrilled! your's looks fantastic! I just don't think I could love that idea more! Now I see why you took ALL of those windows. Your brain must be full of ideas for them and I can't wait to see what you come up with. That is an AWESOME idea! I'll be honest I never would have thought of that on my own! Thanks for the idea! Very crafty! I look forward to next Monday! I'm a little late but am LOVING this idea! 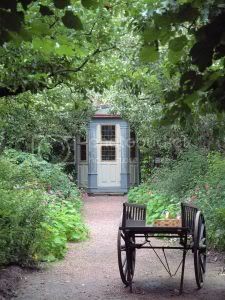 I have been planning on doing something similar, but haven't had a chance... I'm hoping to get it done this month though! Oh my gosh! I love that idea!